I don't often eat purely vegetarian. There are a few exceptions, and falafel is one. This is a fairly common fast food in Sweden, served at the same places that have kebab. (And kebab in Sweden, for the record, is what's called Döner Kebab in other places. More about kebab here.) The origin is middle-eastern, and you can learn more about it from Wikipedia. I never eat it in fast-food places though - it's usually served with hummus, which I don't like, and it's also not as good when it's been kept warm for a while. No, freshly cooked is the key here. I can't really say that I make my own falafel, at least not from scratch. This is one of fairly few foods that I rather have from a box. There are excellent mixes to be found in exciting, small, exotic stores, and I much rather get one of those than start by mixing my own chickpeas. Why improve on perfection? Anyway. I get the mix, and then you just mix it with a little bit of water, let it rest for fifteen minutes, and the it's ready to be rolled into little flattened balls and fried in oil. I use an old cast-iron pot for frying, it works perfectly. 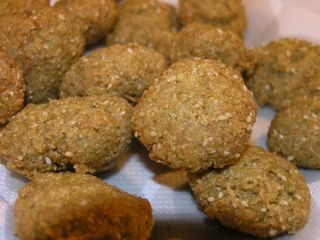 The falafel is ready when it's reached a light golden brown color. And here is a very cool little falafel game! We ate this with warm pita bread, sliced red onions, lettuce, tomatoes and a most awesome raita-tzatziki that I will call... raitziki. (Tzatziki would be the same recipe, but minus the sugar and the coriander. Those, in my opinion, are rather in a raita, but then they wouldn't be accompanied by garlic.) Here you go!